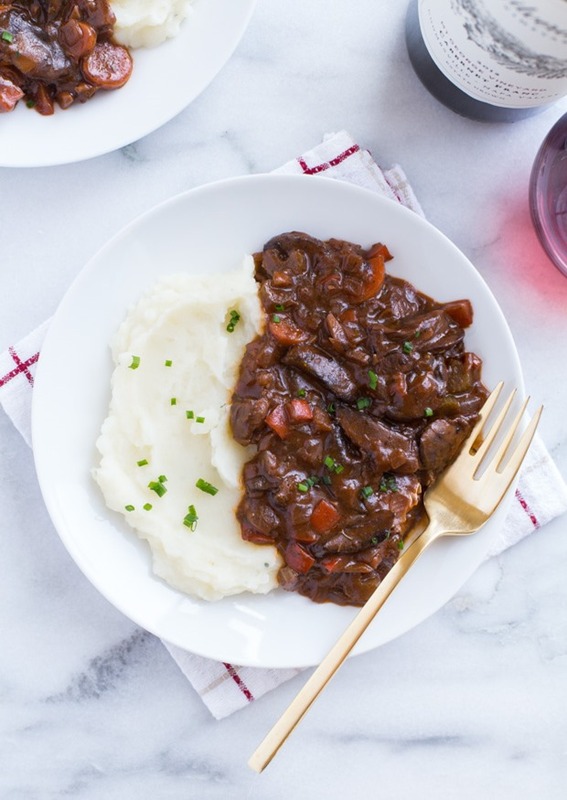 This Vegan Mushroom Bourguignon is a healthy and comforting meal that’s perfect for a romantic night in. It’s naturally gluten-free too! I know Valentine’s Day is considered a “Hallmark holiday” but I can’t help feeling lovey dovey this time of year. It probably has something to do with all of the chocolate. I’m obviously not doing the best job convincing you to stay-in this Sunday, but if that’s what you happened to have planned then I’ve got the perfect romantic meal for you to make! Some of you may have heard of Beef Bourguignon which is a traditional French recipe made with burgundy, or red wine. I consider anything French to be synonymous with romance and the fact that it’s made with red wine immediately takes it up about five notches on my love meter. 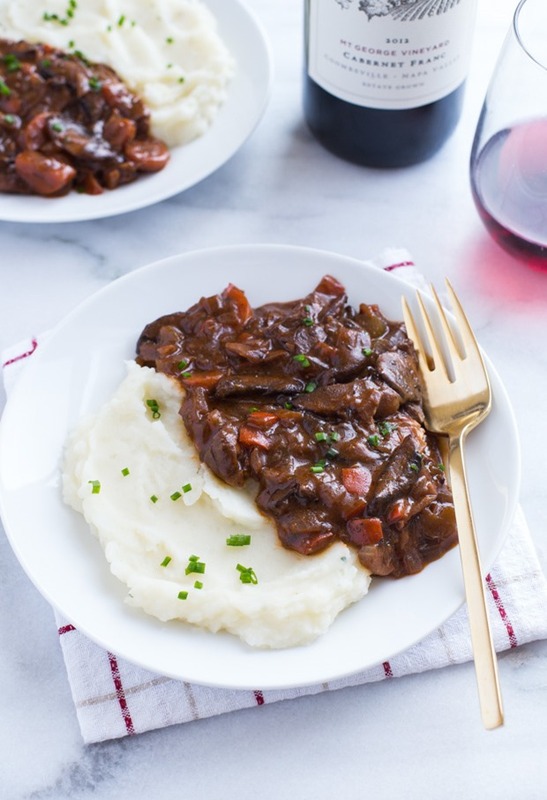 While I’ve never actually had Beef Bourguignon, I’ve made this vegan version with mushrooms many times over the past couple of years and this is the second time it’s made an appearance on the blog. Since then I’ve tweaked it slightly to make it more flavorful, and also updated the pictures in efforts to do it the justice it deserves. The main difference between the first version I shared and this one is the addition of dried porcini mushrooms. I use them all the time in one of our favorite Giada recipes and I knew they would add a really nice depth to the sauce in this dish. They aren’t always easy to find but most mainstream grocery stores should carry them. I’ve been able to locate them at Publix, Safeway and Whole Foods over the years. For this recipe, you soak them in hot water first so that they release their savory umami flavor into the liquid. Once they’re rehydrated, you chop them up, add them to the pot along with the fresh mushrooms and vegetables, pour in the reserved liquid with full bodied dry red wine, and let it simmer so that it’s absorbs all of that savory goodness. I served it with mashed potatoes instead of pasta which makes it even more comforting and hearty. It honestly has such a delicious, earthy flavor that I would feel confident serving it to any meat eater. Whether you make it for a special occasion or just because, it’s sure to make you feel the love. I hope you enjoy it. Cheers to love! To make the mashed potatoes: Wash the potatoes then place them in a large pot and cover with water by at least three inches. Bring to a boil and cook for about 20 minutes, or until soft enough to mash. I like to pierce it with a knife to check for softness. Drain the potatoes and set aside to cool. Once they are cool enough to handle, use your hands to slide the skins off then transfer them back to the pot. Pour in the almond milk and vegan margarine then use a potato masher to mash together until smooth. Add the garlic salt and pepper then continue to mash until well combined. 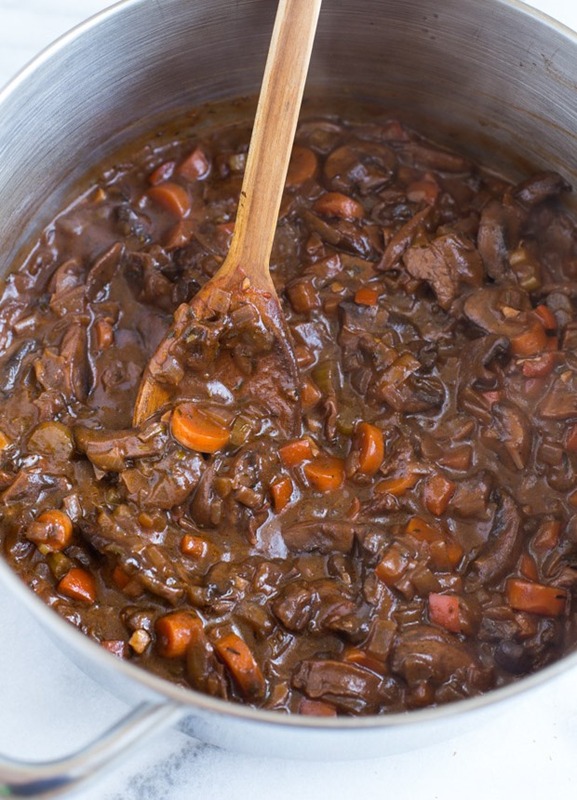 To make the bourguignon: In a measuring cup, add one cup of hot water along with the dried mushrooms and set aside. In a large pot, warm one tablespoon of olive oil over low to medium heat. Add the sliced mushrooms and cook for 3 minutes. Transfer them with their juices to a plate and set aside. To the same pot over medium heat, add the remaining tablespoon of olive oil along with the onion, carrot, bell pepper, garlic, thyme, oregano, salt & pepper and cook for 5 minutes. 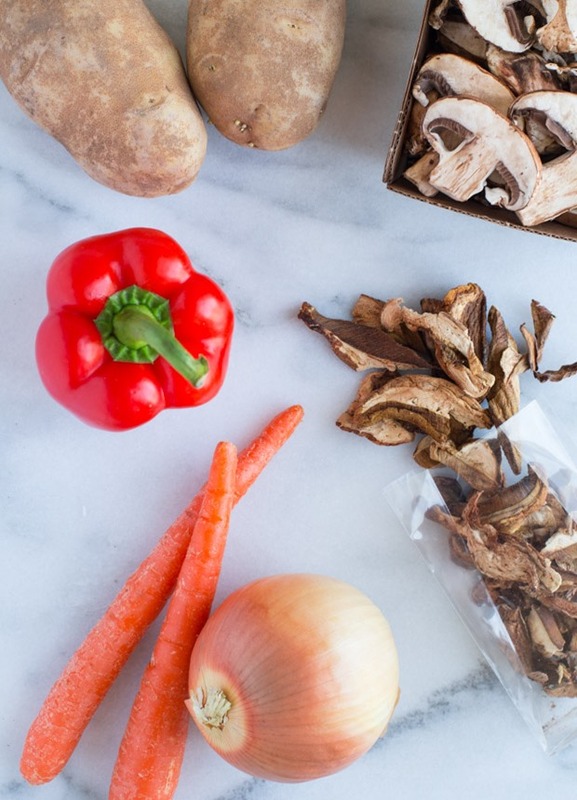 Remove the dried mushrooms from the measuring cup while reserving their liquid. Discard any hard pieces then finely chop the rest. Add them to the pot along with the cooked mushrooms and 2 tablespoons of tomato paste. Stir everything together and cook for another 5 minutes. Pour in the red wine and the mushroom liquid then bring to a boil. Allow to cook for 10 minutes, until liquid has reduced by half, then reduce heat to low. In a small bowl, combine the vegan margarine and the flour by mashing them together with a fork. Add it to the pot and stir together until the sauce thickens. Serve warm with mashed potatoes, top with chopped chives and enjoy! French food always makes me think of romance too, and I could easily eat this mushroom bourguignon and forget all about the beef! This meal would be perfect for Valentine’s Day, which happens to be a day that I never want to go out to eat. haha This looks delicious, Sarah, and I hope you get your night out! Hi Sarah! Your recipe is amazing :)) However it is not so great you write to someone who didn’t mention their orientation “hope you enjoy the night in with your husband”…unless someone has told you, there’s no way of knowing if they’re straight/lesbian/gay/bi. And also might be gf/bf not married. A safer and more inclusive wording would be ‘…with your partner’ :) Hope that makes sense. If you’re wondering why all those assumptions happened without noticing, you should google “unconscious bias”. All the best! Hi Robin! Marcie is actually a close friend of mine who I’ve met so I’m well aware that she has a husband and two sons as well. But thanks for the info! Robin needs to get a grip – she did nothing wrong, so why try to make her feel as though she did? I am soooooooo tired of this stupid, critical world we live in. I wish we had 50’s morals in our society again. This looks like the perfect romantic dinner!! I like your style of making the reservation so he can’t say no, haha! As much as it is nice to stay in and cook, there is something pretty romantic about going out on an actual date! I hope you guys have fun! Once again, it looks delicious! I took a look back at the original post and my comment made me laugh bc I said how beauty-ful your photos were, but then in this one you said you were trying to make them look better. haha. I do agree, the mashed potatoes look even more comforting! I think I’ll have to pin this one for a Meatless Monday. Also, that restaurant you’re going to for Valentines Day looks delish. I want to eat all the items on the menu. ;) Have a great time! Yes, Encuentro is amazing! I love restaurants that show vegetarian/vegan food can be just as creative and flavorful as any meat dish. It’s so good. You should try it out sometime! I’m not sure that I’ve ever had Beef Bourguignon either, but it reminds me of Julia & Julia :lol: I’ve gotta say that I like your version so much better, though. And I honestly can’t believe that I used to hate mushrooms. 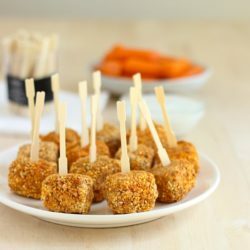 It was a texture thing for me back in the day, but they’re really the perfect substitute if you want to make something feel meaty without going the faux meat route. I agree, they are a great sub for meat and so much healthier than faux meat! I love mushrooms and this looks so creamy and yummy!! haha I like the way you think! We can’t decide what we want to do this year since my parents will be here … so we’ll see! 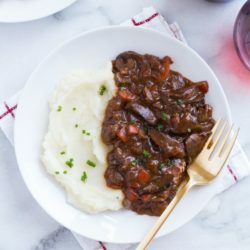 I’ve never had beef bourguignon but this version looks even more right up my alley! Perfect date night food! I get it! As much as I love to cook, every once in awhile I need a day off. It’s much deserved especially with this deliciousness. Mmmm this looks amazing. I love mushrooms so much. Also, French food = romance, every time! I just made this last night. DELICIOUS!!!! I couldn’t find dried mushrooms at Walmart so I skipped that step, and I believe I let the liquid from the sauce thicken too much so I just eyeballed some vegetable stock to thin it slightly. And I used red skin potatoes with the skin on! Amazzzzzzing! Will be making this again! I made this tonight, and it was AMAZING. Bonus points for being easy to make :) I am definitely making this the next time I’m feeding my grandparents. Made this last night as the veggie option for our mixed veggie and nonveggie family. It was delicious, and not nearly as time consuming as beef bourguignon. The porcini liquid is great, but it’s important to be careful when adding it in case there is some sand or grit that falls to the bottom of the dish you soak the mushrooms in. Thanks for a great recipe! Thanks for the feedback, Vivian! I’ve never had any issues with sand or grit…you might try to separate that before you add the mushrooms to the liquid. I appreciate you sharing the tip for others! I made it!! Absolutely delicious. No one commented on the lack of meat. So happy to have really satisfying vegan recipes. Thank you! This looks like the one!!! 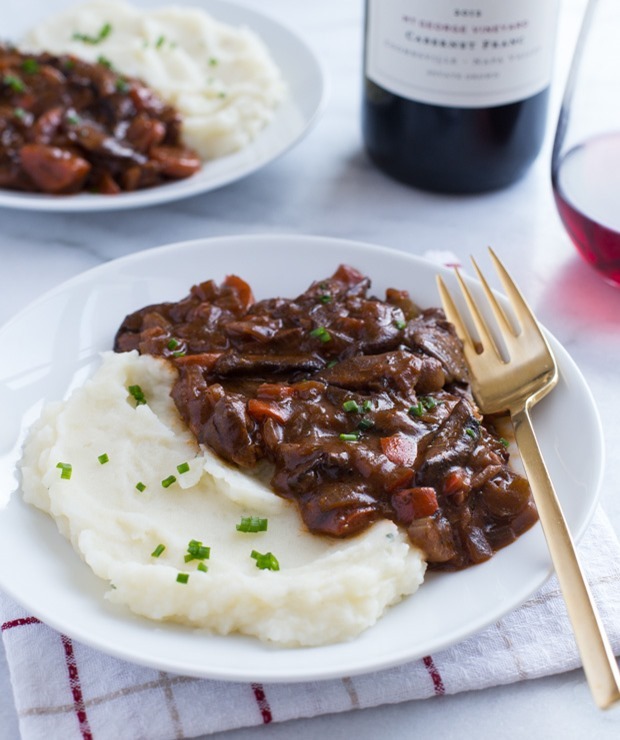 I am going to make this tomorrow without the dried shrooms (don’t have any) but I’m sure all will be fine … I’ve been looking through Vegan Mushroom Bourguignon recipes today and this is the one I want to try. Just so you know, the dried mushroom liquid is what gives this recipe it’s awesome flavor. It should still be good without it, but not as good. If you can find them at the store, they are definitely worth it! I will get some next time, I’m on a tight budget so living frugally and loving it. I’m using Portobello and closed cup mushrooms and I’ll be slicing not dicing my carrots for some extra chunk. I know it’s not exactly to your recipe (I hope you don’t mind but definitely next time it will be) but yours is definitely the best one I can find for my personal tastes, the odd bit of tweak today. it turned out really well, I went for the chunky vibe but I will definitely try this exact recipe next time and let you know it goes. I’m happy to hear that! Thanks Keely! I’ve never made traditional Beef Bourguignon, so I have no idea if this is standard. Can you tell me what the rational is? It seems like a backwards roux to me and I can’t figure out why it would work. How does it not make the sauce gritty? Hi Mandy! You’re right, it is kind of like a backwards roux. I find it’s much easier this way and it will not make the sauce gritty so long as you use a finely ground flour (like all-purpose) and whisk thoroughly until it dissolves. Let me know if you give it a try! I need to use gluten free flour. I see in the ingredients you mention brown rice flour specifically. Have you used this with success? Yes I have used brown rice flour and it works. Oat flour will probably work as well! Happy to hear that! Thanks for the comment, Lynda! I haven’t tried freezing it but I’m sure it would work fine! Thank you so much for the awesome review, Jessica! I’m honored to have my recipes prepared in your kitchen. This was OUTSTANDING!!! I could actually only eat about half of my plateful, it was so rich! 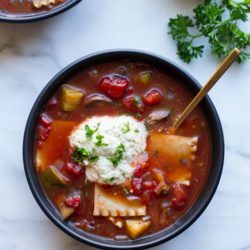 It is hard to find vegan recipes that are so hearty but this one is some serious comfort food. I too balked at the price of the dried porcini mushrooms but it was well worth it. 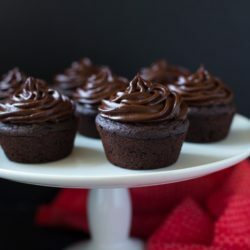 Thank you for a delicious recipe that I will make again and again! Did not have porcini mushrooms so just left them out and subbed in vegetable broth for the mushroom water. Also subbed in coconut cream for the Earth Balance. Only had rose potatoes so did not make the mashed; roasted them instead. 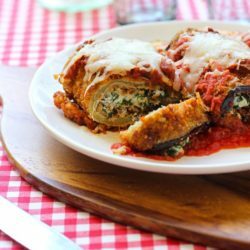 This dish was oh-so-good… a comforting and filling meal to serve my family. Tried to give it 5 stars. Re-submitting! Comforting, filling, and oh-so-good. A great way to herald the beginning of fall. A lovely recipe but is taken up a notch by cooking onions a little longer and braising the whole dish slowly in the oven for 45 mins. Makes for a richer flavour and darker colour. I didn’t have vegan butter but olive oil worked fine (add liquid to paste and then transfer to avoid lumps). Vegan-ish carnivore loves this! Saved and printed! Made this for lunch as a trial run before Christmas Dinner. Such good flavor! Definitely a win! Can’t have fat so didn’t use the vegan margarine with flour. I mixed 2 Tbl cornstarch with the wine before adding. Perfect! I will serve with boiled yellow Finn potatoes on Christmas Day along with other veg and the meat eaters can enjoy their beef alongside. 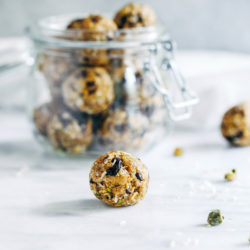 Grateful for a delicious recipe where I won’t feel deprived!